He gets to do this again in two nights. You can make a strong argument that Tampa Bay reliever Grant Balfour is the best Australian pitcher in baseball history. (Apologies to Graeme Lloyd.) He throws extremely hard, he's notoriously intense — he's renowned for screaming obscenities at himself on the mound, even when he's doing well — and he just has the general look of a guy with whom you do not want to trifle. Until last night, he was most well known for almost getting into a fight with Orlando Cabrera during last year's ALCS ALDS. Now he's the guy who, just before Lou Gehrig is about to give his "luckiest man alive" speech, unplugs the microphone. Last night's Yankees' 4–2 win over the Rays was an instant classic at the new Yankee Stadium, the loudest the place has been all season, a terrific game with a dramatic pinch hit home run in the bottom of the eighth by a Yankees legend. But it was almost even more: It was almost the night that Derek Jeter broke Lou Gehrig's Yankees hit record. It probably would have been, too ... had it not been for Grant Balfour. You had a sense this would be Jeter's night in the first inning, when, in one of those classic Jeter moments that make his fans swoon and his detractors groan, he bunted on Jeff Niemann's first pitch for a hit. The 0-for-12 slump was instantly forgotten, and Jeter appeared energized and relaxed at the plate for the first time since the homestand. If he were to garner enough at-bats, it would be his night. But then Niemann shut the Yankees down for seven innings ... giving up just one run (and two Jeter hits). Then the eighth inning, and the parade of failing Rays relievers. The bullpen has been the source of manager Joe Maddon's agita all season, and the eighth inning was that pain encapsulated: Five pitchers, three outs, three runs. When Balfour gave up the three-run home run to Posada to blow the lead, Yankee Stadium exploded, and they barely had time to settle down and notice Jeter had come to the plate. What more could one ask for? A huge home run, a roaring crowd, one last at-bat to make the record his. It was perfect. It was ready to be a game that the YES Network shows all winter to get you through the cold, dead months without baseball. And then Balfour walked him. Maddon made his fifth trip to the mound of the inning, slowly, and took Balfour out. Maddon looked so disgusted you wonder if he did it just so Balfour could hear the boos. Meanwhile, after the game, Jeter, having not talked about it for a couple of days, said, "I'd be lying to you if I said I weren't thinking about it. Pretty much everywhere I've gone this entire homestand, I've been hearing it. On the street, in cabs, at the Stadium, 'When you gonna get a hit? When you gonna get a hit?'" For the record, we do not believe Derek Jeter ever has to hail a cab. 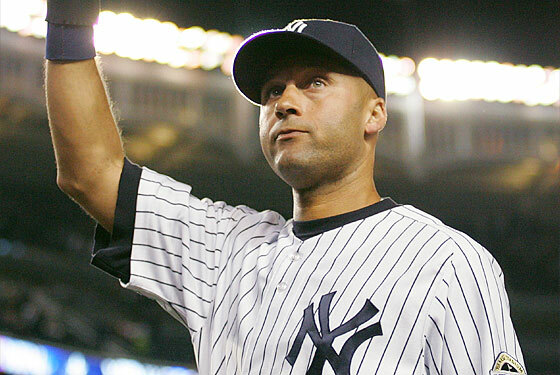 Jeter will try to break the record Friday at the Stadium against the Baltimore Orioles. Your starting pitcher is Chris Tillman. You can pretty much guarantee Jeter's going to see something to hit.